Gurkha Cigars, makers of the world’s finest and most expensive cigars, have partnered with Trump National Golf Clubs to sell the full line of Gurkha cigars, including the $1,500 His Majesty’s Reserve Remy-Martin Louis XIII Cognac infused cigar, on site. Each of the 19 properties will carry Gurkha’s renowned cigars, starting today with Trump National Golf Club in Doral. The next property to come on board will be the Trump National Golf Club in Westchester, NY. The remaining 17 properties will roll out throughout the next golf season. It only makes sense that the world’s most expensive cigars partner with one of the world’s finest brands in luxury resort and golf destinations. Gurkha is proud to now become a staple structure to the Trump Golf Courses and the Official Cigar of Trump National. Gurkha Cigars are known as the Rolls Royce of cigars. They’re not only unique blends with incredible flavor profiles, but they’re wrapped in stunning, award-winning and creative packaging. Gurkha now offers 48 distinct brands of cigars. There are core brand such as the Cellar Reserve, Royal Challenge, 125th Anniversary, Ghost, Seduction, Assassin and Ninja. The limited edition brands, including the newest super-premium luxury cigar the Maharaja, the His Majesty’s Reserve, Cellar Reserve Limitada, Cellar Reserve Edicion Especial, Cellar Reserve Platinum and Triad. The East India Trading company brands include the Nemesis, Wicked Indie, Rogue, Red Witch, Prize Fighter and Classic: Havana Blend. Gurkha also owns the Pedro Martin brand, offering three sizes from that famous master blender. Steeped in legend and rich in history, Gurkha Cigars were named after Nepalese warriors whose bravery impressed the British soldiers. The company was purchased by Kaizad Hansotia in 1989 for all of $149 with the intention of giving the cigars as unique gifts to customers of his family’s watch business. The cigars were such a big hit that Hansotia realized he was on to something. He began to expand the line into what it has become today, one of the most famous brands of cigars in the world. Gurkha produces eight million cigars per year that are sold in more than 50 countries worldwide. For additional information, visit www.gurkhacigars.com. The holidays are a time for celebrating and what better way to celebrate than to light up a favorite cigar. Smoking cigars gained favor after the Civil War and has increased in popularity ever since. There are as many opinions about the finest cigars as there are actual cigars. However, a consensus among cigar aficionados who have ranked the best cigars in the world, rated the following among the top five cigars to enjoy during the 2014 holiday season. The world’s most expensive cigar is the Gurkha “His Majesty’s Reserve.” The Gurkha HMR is a rare and special cigar, famous for its distinctive taste. It’s a blend of 15-year-aged Connecticut Maduro wrapper with 12-year-old Dominican binder and filler that’s aged with one full shot of the world’s finest cognac - Louis XIII. Only 75 boxes are made annually, so don’t delay in getting yours. The amazing aroma as well as the taste of the cigar will be something that you will never forget. It retails for $1,500 per stick. The Ashton Estate Sun Grown made Cigar Aficionado’s Top 25 Cigars of 2014, coming in at number eight. This cigar is named for its very rare wrapper, a sun-grown, Cuban-seed leaf from Chateau de la Fuente, the home of Fuente Fuente Opus X. According to CigarAficionado.com, Estate Sun Grown cigars can have a mellow start but they typically pick up in strength, leading brand owner Robert Levin to dub them “the Velvet Hammer” due to their sneaky strength. The nutty smoke had notes of cream, leather and earth, with a touch of almond on the finish. It retails for $20 per stick. The Cohiba Behike cigar is one of the world’s most expensive cigars. According to WorldsMostExpensiveCigar.com, it was named after the tribal chief of the Taino Indians and developed with a secret blend of the best Cuban tobacco from the Pinar del Rio, Vuelto Abajo. The Cuban cigar industry has gone to extraordinary lengths to ensure that this new line is special in every way. Not only are all the three sizes entirely new, but there is also a special classification of leaf within the blend of the filler, known as Medio Tiempo, which gives the new line a unique, distinctive taste. The natural scarcity of Medio Tiempo leaves dictates that annual production of these cigars will be restricted. The Behike BHKs are set to become Cohiba’s most exclusive line and to represent the highest grade of cigar in production in Cuba today. It retails for $470 per stick. Also making a big impression is the Davidoff Nicaragua Toro, a 100% Puro Nicaraguan blend with a 10-year aged Habano Seed Nicaragua Rosado wrapper, a Jalapa binder and a blend of filler tobaccos cultivated in Esteli, Condega, and Ometepe. According to CigarJournal.com, this cigar has flavors of roasted coffee beans and dark, bitter chocolate that develops into a creaminess that grows excitement and balance, becoming the kind of experience that only Davidoff can create. It retails for $16.50 per stick. The Monte by Montecristo Jacopo No. 2 is a remake of what Altadis did with its Romeo y Julieta cigar a few years ago. According to Cigar Aficionado, who rated this cigar as number nine of their top 25 cigars of 2014, where most Dominican Montecristos are mild, with Connecticut-seed wrappers, Monte by Montecristo Jacopo is blended with Ecuador Havana wrapper, Dominican filler and two binder leaves, one Dominican olor, the other Nicaraguan Corojo. The cigar has plenty of leather and spice on the palate, with a note of chocolate on the finish. It’s a delicious new take on a celebrated old cigar brand. It retails for $10. Cigar smoking is more popular than ever and it’s not only men who are indulging. More and more women have taken up the “leaf” and an overwhelming percent of them say their cigar smoking has increased in the past year. Cigars are also a hot news topic worldwide and trending all over social media given the talk of ease of trade between the U.S. and Cuba. There are hundreds if not thousands of different types of cigars and dozens of variables that go into making each one unique. But for the discerning cigar aficionado, the following five are the highest ranked cigars in the world. They are a must-have for the serious collector. The world’s most expensive cigar is the Gurkha “His Majesty’s Reserve.” The Gurkha HMR is a rare and special cigar, famous for its distinctive taste. It’s a blend of 15-year-aged Connecticut Maduro wrapper with 12-year-old Dominican binder and filler that’s aged with one full shot of the world’s finest cognac - Louis XIII. Only 75 boxes are made annually, increasing its demand. The amazing aroma as well as the taste of the cigar will be something that you will never forget. It retails for $1,500 per stick or $30,000 for a box of 20. The Special Double R from Davidoff is an extravagant cigarthat was created to capture life’s magnificent moments that require relish and pleasure. It was created from four different tobacco harvests that fluidly blendsand harmoniously balances leather and pepper notes. It is a Connecticut Double Corona that lends itself toward the full-bodied range and a well-rounded character. It retails for $726 for a box of 25 cigars. The Bolivar Libertador is big cigar. The ring gauge is a thick 54 with a length of 6.4 inches. Its intriguing with a lovely dense brown finish to the wrapper leaf. It has the same bold profile of Bolivar’s flavors and aroma. It’s still a bit young and needs some aging, but it’s available in limited in quantities so get them while you can. It retails for $164 for 10 cigars. Gurkha’s East India line has a Classic Cigar: Havana Blend that took years of searching for the right wrapper and combination of tobaccos to create this beautiful Nicaraguan masterpiece. It then took 20 “tweakings” of the proprietary blend until they got it right! It has a San Andres Wrapper, is boxpressed with a medium body and full flavor that includes earthy, nutty undertones. It retails for $8 a stick or $160 a box. The La Flor Dominicana Air Bender lives up to its reputation for power and being full flavored. It’s from a blend of Litto Gomez’s homegrown Dominican filler and binder tobaccos that include some piloto Cubano, Sumatra seed and Corojo. The smoke is finished with a gorgeous Habano-seed wrapper leaf grown in Ecuador. It is asmooth and flavorful cigar with lots of body. It provides a unique smoking experience and retails for $8 a stick or $162 for a box of 20. In keeping with consumer demand, Gurkha Cigars, known internationally as much for their super premium luxury cigars as well as for their innovation, has created their first Lancero-sized cigar in The Classic Cigar: Havana Blend. The Classic Cigar: Havana Blend created by Lopez and CEO Kaizad Hansotia is part of the company’s East India Trading Company line. "After a few years of searching for the right wrapper and combination of tobaccos, we created this beautiful Nicaraguan masterpiece,” said Hansotia. It has a Mexican San Andres wrapper over Nicaraguan binder and fillers. It’s medium bodied and full flavored with earthy, nutty undertones. It retails for $8 a stick. THE GURKHA SHAGGY IS BACK! The popular Gurkha Shaggy Cigar, named for its signature unfinished foot, is back and available for shipping on April 1. The Gurkha Shaggy, created by founder and CEO Kaizad Hansotia and first released in 2001, was extremely popular. It is an unbanded cigar that captures the old-world look and feel of a classic cigar smoking experience from a bygone era. Adding to its allure is how it’s packaged. It comes in a traditional box of 25 encased with the loose tobacco. There will be 2,000 boxes of each of the four sizes of the Shaggy releasedtwice a year. The price is $8 for a Robosto, $8.50 for a Toro, $9 for the Churchill and $9.99 for the XO. These cigars will be available in the U.S. starting April 1. Gurkha cigars are rich in legend and history. Named for the brave soldiers of Nepal who fought valiantly alongside the British, has become the most famous brand of luxury cigars in the world. Gurkha Cigars has a blend for every palette and is enjoyed by millions around the world. Gurkha produces eight million cigars per year that are sold in more than 58 countries worldwide. And while Gurkha is known for its exclusivity, flawlessly handcrafted, premium cigars created in a variety of strengths, tasting profiles, and price-points. No matter what your taste, there's a Gurkha cigar that's perfect for your palate. And each Gurkha brand has its own artistically created packaging further separating that brand from any other. The Gurkha Cigar Group Inc. is located at 6600 Hiatus Road, Tamarac, FL 33321. For information, visit www.gurkhacigars.com. Guests of the luxury hotel chain Ritz-Carlton now have the unique ability to enjoy the world’s most expensive cigar, the His Majesty’s Reserve by Gurkha Cigars, on site at Ritz-Carlton’s nationwide. The Gurkha His Majesty’s Reserve is a very special cigar. Famous not only for its unique price point, it also has an incredibly distinctive aroma and taste. It’s a blend of 15-year-aged Connecticut Maduro wrapper with 12-year-old Dominican binder and filler that’s aged with one full shot of the world’s finest cognac: Remy Martin’s Louis XIII. Louis XIII Cognac is a blend of 1,200 eaux de vie from the Champagne region of France, aged between 40 and 100 years old in oak barrels that are several hundred years old as well. Louis XIII Cognac alone sells for about $2,400 a bottle. And now the His Majesty’ Reserve, one of the many reasons Gurkha’s are known throughout the world as the Rolls Royce of Cigars, can be enjoyed at Ritz-Carlton’s throughout the U.S.
Steeped in legend and rich in history, Gurkha Cigars were named after Nepalese warriors whose bravery impressed the British soldiers. The company was purchased by Hansotia in 1989 with the intention of giving the cigars as unique gifts to customers of his family’s watch business. As a result, the company has been reborn and become one of the most famous brands of luxury cigars in the world. Bill Clinton, Bill Gates, Carlos Slim and an assortment of global dignitaries, world leaders, government officials and celebrities as well as the Special Forces and Seal Team Six are all clients. Having extraordinary quality, premium blends of tobacco and a reputation for unparalleled excellence, Today Gurkha produces eight million cigars per year. They are sold in more than 50 countries worldwide. Each Gurkha cigar provides a luxurious experience different from the last. Visit www.gurkhacigars.com for additional information. Gurkha Cigars, makers of the world’s finest and most expensive cigars,continues to make a name for itself this holiday season with a variety of artistically innovative boxed holiday gift sets that house some of the world’s most-renowned blended cigars. This year’s stunning offerings come in a variety of strengths, tasting profiles and price-points. No matter what your preference, there's a boxed Gurkha gift set perfect for your palate. The gift sets range from $35 to $30,000, providing an option for every cigar lover in your life.Details on each of the gift sets is below. • The Gurkha Grand Reserve Five-Pack contains five of the flagship Grand Reserve cigars in wax-capped tubes. It’s beautifully packaged in a custom-designed box and retails for $75. • The Gurkha Godzilla Pack is a handsome sampling of eight Gurkha 6x60 cigars. This unique tour of Gurkha’s cigars retails for $50. • Gurkha’s Private Select Five Pack contains five Private Select cigars infused with seven-year aged Ron Abuelo Rum wrapped in wax-capped glass tubes. The Maduro-wrapped cigars are packaged in an elegant boxed set. It retails for $64. • Gurkha’s Centurion Gift Pack is a suede-rolled container full of five cigars. There’s a booklet attached to the lid. This innovative gift item retails for $35. • The Gurkha Knife/Lighter Pack is a signature gift pack. It includes one Challenge Coin Key Chain, a knife for U.S. purchasers or lighter for International purchasers and five individual 5x52 cigars. They include the Beauty, the Beast, the Crest, the Grand Reserve and the Signature 1887. This stylish and decidedly macho gift set retails for $44. • Gurkha’s Crystal Kraken features a glistening acrylic case, showcasing three of Gurkha’s most celebrated Kraken (6x60) cigars. They are the Cellar Reserve, the Cellar Reserve Limitada and the Cellar Reserve Edicion Especial. This gift set retails for $44. • The military-favorite Gurkha Sniper gift set is encased in a sturdy, air-tight travel case humidor that includes 20 Churchill cigars, a knife and challenge coin. It retails for $240. • For the super-premium, luxury cigar smoker, Gurkha has released its limited-edition “His Majesty’s Reserve” bookend cigar box with 20 Churchill Maduro Cigars that are infused with one shot each of Remy-Martin Louis XIII Cognac. It retails for $30,000. Single sticks are also sold at $1,500 each. • And it’s most recent release in the exclusively unique category is Gurkha’s limited- edition “Maharaja” cigar. Each cigar is encased in its own piano-finished coffin surrounded by a Mahogany, piano-finished box. It contains 10 cigars and retails for $20,000. Individual cigars are also sold at $2,000 per stick. There’s a reason Gurkha cigars are known as the “Rolls Royce” of cigars and this season’s gift sets once again prove why. Steeped in legend and rich in history, Gurkha Cigars were named after Nepalese warriors whose bravery impressed the British soldiers. The company was purchased by Kaizad Hansotia in 1989 with the intention of giving the cigars as unique gifts to customers of his family’s watch business. As a result, the company has been reborn and become one of the most famous brands of cigars in the world. Gurkha caters to an elite clientele from Special Forces and Navy SEAL teams, A-List celebrities, and Fortune 500 CEOs to Monarchs, Sheiks and Presidents. Having extraordinary quality, premium blends of tobacco and a reputation for unparalleled excellence, today Gurkha produces five million cigars per year. They are sold in more than 25 countries worldwide. And with 48 brands to choose from, each Gurkha cigar provides a luxurious experience different from the last. The International Headquarters of Gurkha Cigar Group Inc. is located at 6600 Hiatus Road, Tamarac, FL 33321. For information, visit www.gurkhacigars.com. While Gurkha is known throughout the world for making super premium luxury cigars, CEO Kaizad Hansotia knows that change is key in the cigar business and it’s critical for growth to develop new brands. Now, just in time for the International Premium Cigar & Pipe Retailers show, IPCPR, Gurkha has released three new blended cigars that are expected to become blockbusters. They are the Cellar Reserve Platinum Edition,Heritage and The Cask Blend. The Cellar Reserve Platinum Edition is Gurkha’s first Nicaraguan blended cigar in the prestigious Cellar Reserve line. It has an Eduadorianoscuro wrapper and a Nicaraguan binder and 12-year-old fillers from Condega, Esteli, and Jalapa. It’s medium bodied and comes in two three sizes; Kraken 6 x 60, Hedonism 6x58, and Solara 5 x 58. It is specifically blended to deliver the richest characteristics and complexity that comes from Nicaraguan aged tobaccos. It retails for $8.99 - $10.99 a cigar. The Heritage has a rosado Ecuadorian habano wrapper, Nicaraguan binder and Dominican, Pennsylvanian and Nicaraguan fillers. It’s medium bodied and comes in three sizes: Robusto, Toro and XO. It’s hand rolled in Nicaragua and comes in a rare 35-count box. This cigar iswas blended by our blending team at American Caribbean Cigars in Nicaragua, with the input of our in-house blender and National Sales Director, Juan Lopez, and the blessings of Kaizad Hansotia.This flavorful blend has rich coffee and dark chocolate tones with a subtle and well-balanced spice present throughout. It retails for $7.99 - $9.99 a cigar. “We’re proud to release a fantastic medium to full-bodied blend in the Heritage Cigar. A true aficionado will not be disappointed with the wonderful collaboration of flavors in this cigar,” says Kaizad Hansotia, President and CEO of Gurkha Cigars. The Cask Blend is a signature Gurkha cigar. Its wrapper, binder and filler are highly guarded proprietary secrets. It’s medium bodied and hand rolled in the Dominican Republic. It comes in two sizes;: 5 x 58 and 6 x 58. It comes in a striking new wooden 200-count box styled like only the artisans at Gurkha know how to do.The Cask Blend’s unique flavor notes are complemented by the natural richness of the proprietary wrapper, binder and fillers. It’s a rich and complex cigar like the Gurkha brand itself. It boasts notes of sweet spice and rich cedar. It retails for $7.99 to $8.99 a cigar. According to Hansotia, “When developing new brands, I always remind myself of the military themes that coincide with the Gurkha soldiers, but more importantly, I think of the consumer and what drives their palate. I follow the market and listen to what consumers are asking for. Even when I travel, I stop into cigar shops around the world and ask people for their input in a cigar profile. Today Gurkha produces eight million cigars per year. They are sold in more than 50 countries worldwide. Each Gurkha cigar provides a luxurious experience different from the last. Housed in a beautifully appointed facility in South Florida, Gurkha has core brands, limited edition brands and an entire line of innovative and affordable brands through its East India Trading Company line. Steeped in legend and rich in history, Gurkha Cigars were named after Nepalese warriors whose bravery impressed the British soldiers. The company was purchased by Kaizad Hansotia in 1989 for all of $149 with the intention of giving the cigars as unique gifts to customers of his family’s watch business. The cigars were such a big hit that Hansotia realized he was on to something. He began to expand the line into what it has become today, one of the most famous brands of luxury cigars in the world. Gurkha Cigars, known for producing the world’s most expensive cigars, just launched a military-inspired Sniper Cigar and Case that includes a custom-made knife and challenge coin to pay tribute to the service and sacrifices of America’s military. Named for the brave soldiers of Nepal who fought valiantly alongside the British, Gurkha’s new product pays homage not only to the company’slong-standing heritage of saluting our elite Special Operatives, but also its unparalleled commitment to making some of the finest cigars in the world. Gurkha is the celebratory cigar of the United States Green Berets, Delta Force, Rangers, Air Force Special Ops, Marine Force Recon and the Navy SEALs, including the legendary SEAL Team Six.Gurkha cigars are unwrapped and enjoyed after battles are won in countries all over the world wherever American Forces are deployed. Paying tribute to these exclusive warriors, Gurkha has designed a limited-edition cigar called Sniper and encased them in a near-impenetrable black Sniper Case cigar box. The Sniper cigar is a medium-to full-bodied cigar with a Dominican wrapper, Indonesian binder and Dominican/Nicaraguan filler. It’s 7.5 inches long with ring gauge of 52. It is sold 20 to a box for $250. The Sniper cigar box is a handsome Pelican-style, waterproof cigar case that has three layers of protective foam inside. It holdstwo layers of 10 cigars each, cushioned in between three layers of foam. This extremely durable case also includes a limited edition combat knife wrapped in its own protective sheath. It’s not only a cigar box, but a travel humidor too. Gurkha cigars are rich in legend and history. They have become the most famous brands of luxury cigars in the world. Former President Bill Clinton, Microsoft Founder Bill Gates, Actor Matthew McConaughey and dozens of A-List Celebrities, Fortune 500 CEOs, Monarchs and Sheiks as well as the Special Forces and Seal Team Six are all clients. Steeped in legend and rich in history, Gurkha is to cigars what Marilyn Monroe was to motion pictures: an internationally coveted symbol of sensuality capable of overwhelming the senses. It’s why under the Gurkha name the tagline reads “World’s Finest Cigars.” Gurkha is the standard of super-premium luxury cigars -- a smoke for those who not only expect excellence but demand that standard of quality every time. Even the name “Gurkha” is significant. The Gurkhas were the courageous Nepalese warriors who fought alongside the British, during England’s reign of supreme power. Hansotia kept the tributary name when he purchased the company in 1989 and began to give out the cigars to customers of his family’s watch business as gifts. The cigars were such a big hit that he began to expand the line into what it has become today, one of the most famous brands of luxury cigars in the world. Gurkha continues to make a name for itself among connoisseurs not only for using the finest tobacco in its superb blends, but for the artistically creative packaging it wraps around its cigars. With an impressive array of flawlessly handcrafted, premium cigar lines in a variety of strengths, tasting profiles and price-points; no matter what your taste, there's a Gurkha cigar that's perfect for your palate. While the popular Gurkha brand has many different lines, there are still some cigars available only in limited editions. The most famous of which is the above mentioned His Majesty’s Reserve. The HMR is a blend of a 15-year Connecticut Maduro wrapper with 12-year-old Dominican binder and filler that’s aged with one bottle of the world’s finest cognac: Remy Martin’s Louis XIII that retails for $2,400 a bottle. Only 75 boxes are made in any given year, adding to its exclusivity along with its price tag of $30,000 per box. The HMR is only one of the reasons Gurkha’s are known to many as the Rolls Royce of Cigars. Each Gurkha cigar provides its own unique luxurious experience. The flagship Gurkha cigar is its best-selling cognac-infused Grand Reserve cigar. It has a silky five-year Connecticut wrapper with an aged three-year binder and filler that is packaged in a gorgeous glass tube. It rates a 91. Another groundbreaking cigar came out on the anniversary of Gurkha putting its name on cigars, which dates back 125 years. Using a carefully chosen blend of selected tobaccos, the 125th Anniversary cigar is a blend of an oily Cubra Habano wrapper accompanied by an Ecuadorian Habano binder and a complex combination of Nicaraguan, Brazilian and Dominican fillers. This intriguing medium-bodied cigar encompasses a very smooth and complex taste profile with flavorful notes of rich tobacco and subtle hints of sweet spice, vanilla and chestnut. It was rated 96 and won the Golden Label Printing Award. Another innovative brand is the vintage Cellar Reserve cigar. It uses the finest quality 15-year-old aged tobacco, comprised of an oily Criollo 1998 wrapper that combines an aged Dominican, Olor binder with a 15-year old Dominican filler. Housed in unique wooden boxes that aesthetically evoke a maturing wine barrel, the Cellar Reserve is a delicious medium- to full-bodied cigar that is full of flavor and complexity. It was rated 97 out of 100 and named Top 10 Cigar of the Year. Gurkha’s Royal Challenge is also a popular cigar. It has a mild-to-medium body that’s smooth and complex. The blend is highlighted by an aged silky Connecticut/Ecuadorian shade wrapper and a Habano/Honduran binder that is perfectly complimented by Nicaraguan and Dominican fillers. It is rated 91 out of 100 and also a winner of the European Printing Awards. One of the newest Gurkha cigars released is a collaborationbetween two companies with proud and long-established traditions: Gurkha and Ron Abuelo. Named ‘Private Select,’ this cigar is medium bodied with hints of cocoa and nuts. The Maduro wrapper is the perfect marriage with the sweetness of the seven-year aged Ron Abuelo rum. The fullness of toffee and cocoa flavors are accentuated from the rum, while hints of leather and earthy undertones come through with the Nicaraguan cigar. Paired with Ron Abuelo Rum or standing alone, the Private Select is inviting to any palate. More than a century ago, Gurkha cigars became one of the most famous luxury cigar brands in the whole world. The great quality and the extraordinary tobacco mix used, made these cigars an exclusive product with a balanced and stable success.Today Gurkha produces five million cigars per year. They are sold in more than 25 countries worldwide. Their Cellar Reserve was named in the Top 10 Cigar of 2012 and their 125th Anniversary cigar ranked as number 9 in 2013. Gurkha cigars are appreciated by former President Bill Clinton, Captains of Industry such as Bill Gates and Carlos Slim, royal families, sheiks, global dignitaries, world leaders, Hollywood’s most famous celebrities and even the ultra-elite special forces, including SEAL Team Six. It’s safe to say that Gurkha’s have made a mark in history and belong carefully housed in any serious collector’s humidor. Having extraordinary quality, premium blends of tobacco and a reputation for unparalleled excellence, Gurkha now offers 48 distinct brands. These include its core brands, limited edition brands and an entire line of innovative and affordable brands through its East India Trading Company line. While Gurkha’s original super premium luxury cigar the ‘His Majesty’s Reserve’ is infused with Remy’s Louis XIII Cognac at $2,400 a bottle, the ‘Maharaja’ is not infused. It is, however, a secret blend of the best quality tobaccos available.The beautiful maduro wrapper pairs Dominican binder and fillers to create a smooth and sweet taste on the lips. To be enjoyed by true cigar connoisseurs, the Gurkha Maharaja is medium bodied and one of a kind. It retails for $2,000 a stick. As with all luxury premium Gurkha Cigars, the ‘Maharaja’ is available only in small quantities – boxes of 10 cigars - and in limited release - only 100 boxes are being sold. Also, in keeping with the Gurkha tradition of presenting cigars in unique, award-winning artistic packaging, the ‘Maharaja’ is presented in a stunning, 10-count Mahogany wooden humidor with 10 individual piano-finished mahogany coffins for each cigar. It retails for $20,000 a box. Steeped in legend and rich in history, Gurkha Cigars were named after Nepalese warriors whose bravery impressed the British soldiers. The company was purchased by Hansotia in 1989 with the intention of giving the cigars as unique gifts to customers of his family’s watch business. As a result, the company has been reborn and become one of the most famous brands of luxury cigars in the world. Bill Clinton, Bill Gates, Carlos Slim and an assortment of global dignitaries, world leaders, government officials and celebrities as well as the Special Forces and Seal Team Six are all clients. Having extraordinary quality, premium blends of tobacco and a reputation for unparalleled excellence, Today Gurkha produces five million cigars per year. They are sold in more than 25 countries worldwide. Each Gurkha cigar provides a luxurious experience different from the last. The Gurkha Cigar Group Inc. is located at 6600 Hiatus Road, Tamarac, FL 33321. For information, visit www.gurkhacigars.com. Smoking cigars has become more popular than ever with the greatest growth segment being among women. With new fans of both genders joining the ranks of cigar aficionados every day, one question that gets asks most frequently is how to properly smoke a cigar. Bianca Melone, an experienced ‘smokestress’ in her own right and the Director of Marketing for Gurkha Cigars, shares some of her favorite tried-and-true rituals. “Smoking a cigar is all about the experience,” she said. “While we comb the globe to find the finest wrappers, binders and fillers to make our Gurkha Cigars, what we are really doing is creating cigars that are unique and memorable.” Whether you’re a long-time cigar smoker or looking forward to your first time, here are the five smoking rituals explained in detail to make your cigar smoking experience memorable. When you first hold a Gurkha cigar in your hand, admire it. Not only are Gurkhas known for their fine tobacco blends, they are also known for their incredibly artistic packaging. So, by all means, go ahead and admire the beautifully crafted box it came from as well as the artistically designed band around the cigar. A lot of care went into creating them. Next, remove the cigar from its plastic wrapper or glass tube. Inspect the cigar. Pay particular attention to the tobacco leaf wrapper. Look for any inconsistencies. You may see tiny bumps. This is what is referred to as being toothy and it’s not bad. They’re little pimples on the leaf that are filled with tobacco oils. Take the foot or smoking end of the cigar and lift it straight up to your nostrils. This is the best way to smell all the different tobaccos. If it’s a very spicy cigar, it may make you sneeze. Smell the cigar wrapper too rolling it up and down under your nostrils. While you’re doing this you can also feel the condition of the cigar between your thumb and forefinger. It should feel soft enough to be slightly pliable, but not too soft, which would mean that it’s too moist. You should also hear a slight crackling if you hold it up to your ear. That means the cigar is maintained at the right temperature and the right humidity, which is 70 degrees Fahrenheit with 70 percent humidity. When you’re cutting a cigar, there are a variety of options. You can use a single blade called a guillotine cutter or a double blade for a normal straight cut. You can use a punch cut, which will punch into the cap and pull out a small plug or you can use a V-cut. The V-cut makes a cuts in the cap that’s shaped liked a V, hence the name. There is another method that makes a cut into the side of the cigar, but that is less conventional. As far as cutting a cigar, there really is no “proper” way to cut per se. Mostly it’s based on each individual’s personal preference. However, when you are ready to cut to cigar, you want to cut it on the line of the cap where the wrapper begins. That’s the line where the head of the cigar meets the wrapper. You want to cut enough so that you can take a significant draw from the cigar. While we like to say that all cigars are draw tested, it’s not totally accurate. Perfecto shaped cigars cannot be draw tested and that’s because they have what’s called a little pigtail on the end. Our Cellar Reserve cigars have this shape. On these cigars, you have to cut a little bit deeper. That’s because they’re tightly wrapped to give them that awesome shape. Cut enough into the cap to provide a nice even draw that will continue throughout the duration of the cigar. Finally, if your still unsure how to cut your cigar, there is an item called a “Perfect Cut.” This cutter has a flat back that measures the perfect size cut every time. When lighting a cigar, the first thing you do is toast the foot or smoking end. Your goal is to char the end of the cigar. The purpose of toasting the end is to remove any moisture left on the exposed end of the cigar from being in the humidor. You do this before putting the cigar in your mouth and you toast it as if you’re roasting a marshmallow. Hold the cigar slightly above the flame and let the flame do the lighting. You can light the cigar using gas butane, a cedar spill, which is a thin strip of cedar that lights naturally without adding any other toxins or flavors, or any other source of fire you choose. Once you’ve toasted the foot, put the head of the cigar in your mouth and draw, keeping the cigar just above the flame at the foot. Draw and twist to get the entire foot lit. You basically get into a rhythm of puff turn, puff turn until it’s completely lit as evenly as possible. When smoking a cigar, think in terms of thirds. There are three thirds to every cigar. In the first third, you get the draw going. Here’s where you start to taste the flavors and relax into the experience. Sit back and enjoy the cigar with good friends, in a pleasant atmosphere and after good food. Just taste the wrapper, enjoy the flavor profiles and get the cigar moving. In the second third, more flavors start opening up. The smoking experience becomes more complex. As you draw though the cigar, you can visibly see as well as taste the cigar opening up. As the heat comes through the tobacco leaf, it becomes more and more complex. In the final third, you’ll discover the most body the cigar will have. The flavor profiles are enhanced. Finally, as you smoke the cigar, let the ash fall naturally. A longer ash shows that the cigar is better constructed. A cigar with a long ash means the fillers are longer inside. To avoid the ash falling on the floor, you can roll it gently in the ash tray. Never tap or flick. To properly extinguish a cigar, just let it sit and die on its own in the notch of the ashtray. If you snuff it out, it will give out a stale smelling odor. Now that you know the five main rituals involved in smoking a cigar, grab your favorite Gurkha or visit a cigar shop near you to find the perfect Gurkha cigar for you. Then choose a special time to savor the moment. After all, that’s what cigar smoking is all about. Fun, family and friends. Moments that make life memorable. With thousands of cigars on the market today, how can one know how to choose the best cigar possible whether you’re buying it for yourself or as a gift? Most experts recommend that you visit a local cigar lounge and allow the owner or sales person to guide you. Once you establish a baseline taste experience for your palate, then you can try some alternatives to broaden your palate. So, let’s start with cigar 101…the basics of a cigar. The head: This is the rounded end that goes in your mouth. The foot: This is the flat, open side that you light. The wrapper: This is the outside layer of tobacco that gives the cigar one of its primary flavor components. Wrappers are usually very high quality leaves, available in colors ranging from Double Claro, which is the lightest) to Oscuro, which is the darkest. The binder: This is the intermediate leaf used to hold the filler tobacco together. The filler:This is the inside tobacco that forms the center of the cigar. Filler typicallydetermine how strong a cigar smokes. Then there’s the blending of wrapper, binder and filler that is what determines the overall flavor of the cigar. In order to make your experience a most enjoyable one, let’s review the flavor profiles of a cigar. The body is the first thing to consider when looking for cigar. Decide if you are looking for a mild, medium or full-bodied cigar. Then you want to consider the size. How long do you want your first experience smoking a cigar to be? If it’s a short experience, then you want to look for a Toro-size cigar. If it’s longer, then you may want to try a Churchill. Cigars are measured two ways: the length, which is always in inches, and the ring gauge. The ring gaugeis the diameter of the cigar based upon 1/60th of an inch increments. Then we have the flavor profile: What would you like your cigar to taste like? Sweet, smoky,spicy,chocolatey,leathery, peppery, woody, earthy, nutty, creamy,etc. Next is the price: what type of budget did you have in mind? If this is your first time smoking a cigar, stay away from the higher-priced cigars since, at this point, you won’t be able to truly savor the distinguishing elements of an expensive cigar. Besides, price isn’t the most important factor in choosing a cigar. There are plenty of inexpensive cigars that hold top ratings from major cigar publications. And finally, there’s the cigar’s construction. This will determine how smooth and even the draw is when you smoke it. You can test the construction of a cigar by rolling it between the thumb and index finger of your hand. You’re looking to see if it has any lumps. You’re also checking to see that the body is not too soft or void of filling. You want the cigar to have a nice even consistency and fill. A rough texture or any other mark of bad construction means a less smooth draw when you inhale. With a well-constructed cigar, the ash will maintain the shape of the cigar as it is smoked. Whichever cigar you choose, always remember it’s the experience of smoking it that really counts. Enjoy your cigar in a great atmosphere surround by good company. IT’S ALL ABOUT FINDING THE NICHE! 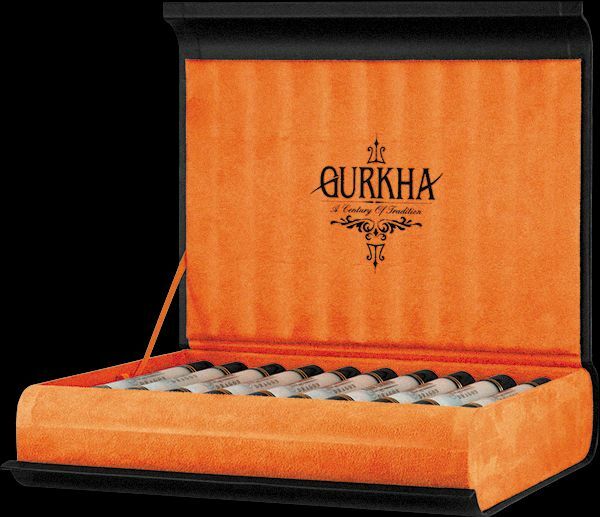 The original Gurkha cigar was founded in Goa, India in 1889. Today, Gurkha produces eight million cigars a yearfrom the tobacco of three nationsthat are sold in 28 countries worldwide. And while we have expanded to include 48 brands divided among our core brands, limited edition brands, East India Trading Company brands and Pedro Martin line, Gurkha remains alone at the top; still sought after for being the company that created the super-premium luxury cigar category. It wasn’t always that way. When I bought Gurkha in 1989, I didn’t know anything about the cigar industry except that I appreciated smoking a fine cigar. So I plunged myself into market research and to my amazement,I discovered a void in the marketplace. There was no category for the premium cigar. Back then, $8 for a single cigar was a lot. I realized at that moment that I had found a niche that was just waiting to be filled. In 1996, we released the His Majesty’s Reserve cigar. In addition to a secret blend of the finest tobaccos money can buy, each stick is infused with a full shot of Remy-Martin’s Louis XIII Cognac. That cigar was and still is the pinnacle of the super-premium luxury cigar on the market today. It retails for $1,500 a stick and comes in a box of 15 for $30,000. It is produced in limited quantities and there is a waiting list to get them. Following the success of the HMR, just this year, Gurkha launched the Maharaja. This cigar is truly the zenith of the world’s finest smoke. It is non infused, made with a proprietary blend of the world’s finest tobaccos and sells for $20,000 for a box of 10. If you do the math, that means each stick retails for $2,000. People associate what they smoke with their personalities and Gurkha is what the rich smoke. If you’re a millionaire you smoke Davidoff, but if you’re a billionaire you smoke Gurkha. And that’s because Gurkha has set the bar extremely high. Adding to the exclusively and allure of our brand is the luxurious Officer’s Cluband private blending room in our international headquarters. If you think Cuban cigars are the best; well guess again. The world’s rarest and most expensive cigars are located right here in South Florida. Like I said in the beginning, it’s all about the niche. Our ultra-premium buyers, the super affluent, are collectors. These ultra-high-net-worth individuals around the globe are our client base. They include superstar athletes, royalty,most of the Maharajah’s of India, presidents and the Who’s Who of A-list Celebrities, such as Matthew McConaughey, Arnold Schwarzenegger, Sylvester Stallone and Harrison Ford. And this is by no accident. The Nepalese warriors who bravely have fought alongside the British for 200 years believe it’s better to die than be a coward.Likewise, for those to whom money is merely a means to an end, what matters most is the experience. And when you are out to enjoy the experience of a lifetime, only the best will do. Gurkha cigars make moments memorable. And that’s our niche. Gurkha Cigars are known the world over as the Rolls Royce of cigars. Kaizad Hansotia, the genius behind the Gurkha brand, has raised the bar so high in the super-premium cigar market that Gurkha stands alone as the zenith of luxury. If you think the world’s best cigars come from Cuba, think again. Gurkha cigars are the most sought after cigar in the world. ho is not only a cigar aficionado, but a devotee to the finer things in life.Hansotia is undoubtedly a genius. He singlehandedly changed the whole cigar industry by introducing and altering the way people thought about cigars. The rise of Gurkha as the manufacturer of the world’s most expensive, super-premium cigars and stunning packaging could be considered a story of legend. That is, if it weren’t all true. After all, Hansotia acquired the Gurkha brand in 1989 for a mere $149. Today,Gurkha produces eight million cigars per year that are sold in more than 58 countries worldwide. And while Gurkha is known for its exclusivity, it has an impressive array of 105 brands of flawlessly handcrafted, premium cigars created in a variety of strengths, tasting profiles, and price-points. No matter what your taste, there's a Gurkha cigar that's perfect for your palate. Hansotia sees to it that. While Gurkha holds the record for the world’s most expensive cigar in its ‘His Majesty’s Reserve’ that retails for $1,750 a stick or $35,000 a box and caters to an elite clientele, A-List celebrities, and Fortune 500 CEOs to Monarchs and Sheiks, there are many facets to this “diamond” cigar company. Gurkha has an absolute cult-like following. People from all around the world go to great lengths to acquire them, it’s astounding. The Gurkha‘His Majesty’s Reserve’ contributed to its reputation as being “The Rolls Royce of Cigars." Itis a blend of a 15-year Connecticut Maduro wrapper with 12-year-old Dominican binder and filler. Each stick is infused with one shot of the world’s finest cognac: Remy Martin’s Louis XIII, a bottle of which retails for $2,400 a bottle. Only 75 boxes are made in any given year, adding to its exclusivity along with its price tag. Gurkha’s growth has included an even more expensive and rare cigar in the ‘Maharaja.’ The ‘Maharaja’ is medium bodied with a secret blend of the best quality tobaccos available.Thebeautiful Maduro wrapper pairs Dominican binder and fillers to create a smooth and sweet taste on the lips. It was created with the true cigar connoisseur in mind. It is not infused and retails for $3,000 a stick. As with all luxury premium Gurkha Cigars, the ‘Maharaja’ is available only in small quantities – boxes of 10 cigars - and in limited release - only 100 boxes are being sold. Also, in keeping with the Gurkha tradition of presenting cigars in unique, award-winning artistic packaging, the ‘Maharaja’ is presented in a stunning, 10-count Mahogany wooden humidor with 10 individual piano-finished mahogany coffins for each cigar. It retails for $30,000 a box. Gurkha has also focused on expanding its popular Cellar Reserve line with the limited edition Cellar Reserve Platinum. The Platinum is a blend of 12-year-old tobaccos in the filler and is the first of the Cellar Reserve cigars to use Nicaraguan tobacco. It comes in three sizes: Hedonism (6 x 58), Kraken (6 x 60) and Solara (5 x 58) and retails for $7.99 to $9.99 per stick or $200 for a box of 20 cigars. Despite the Cellar Reserve cigars being in one family, each has a different flavor profile. The vintage Gurkha Cellar Reserve uses the finest quality 15-year-old aged tobacco, an oily Criollo 1998 wrapperand 15-year old Dominican filler. It’s rated a 97 and named Top 10 Cigar of the Year.The Gurkha Cellar Reserve Limitada is a rich and robust cigar using the finest quality 15-year aged tobacco with a Brazilian ArapiracaMaduro wrapper. It has a 90 rating. And the Gurkha Cellar Reserve Edicion Especial has a Corojo wrapper and 18-year aged tobacco. It rated a 93. “The truth be told, the Cellar Reserve family of cigars is so popular that we struggle to keep up with the demand,” he said. Additional growth has come from the popular blends in its innovative and affordable East India Trading Company line. The most recently released East India Trading Company cigar is the Heritage. It has been so well received that Gurkha can hardly keep up with production. It is flying off the shelves of the 9,000-square-foot humidor in Gurkha’s headquarters.The Heritage has a Rosado Ecuadorian Habano wrapper, Nicaraguan binder and Dominican, Pennsylvanian and Nicaraguan fillers. It’s medium bodied and comes in three sizes: Robusto, Toro and XO. It’s hand rolled in Nicaragua and comes in a rare 35-count box. This cigar was blended by the blending team at American Caribbean Cigars in Nicaragua with the input of Gurkha’s in-house blender and National Sales Director Juan Lopez and Hansotia. This flavorful blend has rich coffee and dark chocolate tones with a subtle and well-balanced spice present throughout. It retails for $7.99 - $9.99 a cigar. “A true aficionado will not be disappointed with the wonderful collaboration of flavors in our Heritage cigar,” said Hansotia. And there are several brand new lines being manufactured in limited edition to be released exclusively at the International Premium Cigar & Pipe Retailers (IPCPR)84th Annual Convention & International Trade Show in July in Las Vegas.Hansotia is keeping the details close to his vest, but he hints to an extension to the line of Cellar Reserve “tubes” and two or three other tubes, including a new limited edition cigar called ‘Dynasty.’ The flavorprofiles will be between medium to heavy, but what makes them so unique is that their production will be limited to half a million sticks for the whole world. The demand for Cellar Reserves exceeds more than two million alone, but that’s what makes Gurhka Cigar Company boutique. There are limited edition and limited quantities per skew. And while the demand for Cuban cigars will most likely increase in the short term once the embargo is lifted because even the casual cigar smoker will be interested to see what they’ve been missing all these years, it won’t be a permanent situation. “The increased demand will probably cause a lower quality product, creating disappointment and sending the regular cigar smoker right back to his or her favorite brand,” he said. “All of these points are, however, positive for the rest of the cigar-making world. Consumers will initially get their “fix” and be driven to better quality cigars made outside of Cuba. Gurkha Cigars quietly carries on a century-old tradition of excellence by bringing the finest cigars to connoisseurs worldwide from its International Headquarters in a beautifully appointed facility in South Florida. Gurkha is a must have for any cigar smoker, be advised once you try these most alluring of all sensations and taste you can never go back to smoking anything else. It truly is the nectar of the gods.For additional information, visit www.gurkhacigars.com. Within the super-premium luxury cigar industry, one brand continues tostand out. That brand is Gurkha Cigars. Steeped in legend and rich in history, Gurkha Cigars were named after Nepalese warriors whose bravery impressed the British soldiers. The company was purchased by Kaizad Hansotia in 1989 for all of $143 with the intention of giving the cigars as unique gifts to customers of his family’s watch business. The cigars were such a big hit that Hansotia realized he was on to something. He began to expand the line into what it has become today, one of the most famous brands of luxury cigars in the world. Gurkha continues to make a name for itself among connoisseurs not only for using the finest tobacco in its superb blends, but for the artistically creative packaging it wraps around its cigars. With an impressive array of flawlessly handcrafted, premium cigar lines in a variety of strengths, tasting profiles, and price-points; no matter what your taste, there's a Gurkha cigar that's perfect for your palate. Today Gurkha produces five million cigars per year. They are sold in more than 25 countries worldwide. Their Cellar Reserve was named in the Top 10 Cigar of 2012 and their 125th Anniversary cigar ranked as number 9 in 2013. They are known to many as "The Rolls Royce of Cigars" andeach Gurkha cigar provides a luxurious experience different from the last.Housed in a beautifully appointed facility in South Florida, Gurkha has core brands, limited edition brands and an entire line of innovative and affordable brands through its East India Trading Company line. While Gurkha holds the record for the world’s most expensive cigar in its His Majesty’s Reserve that retails for $25,000 a box and caters to an elite clientele from Special Forces and Navy SEAL teams, A-List celebrities, and Fortune 500 CEOs to Monarchs and Sheiks, there are many facets to this “diamond” cigar company. The HMR is a blend of a 15-year Connecticut Maduro wrapper with 12-year-old Dominican binder and filler that’s aged with one bottle of the world’s finest cognac: Remy Martin’s Louis XIII that retails for $2,400 a bottle. Only 75 boxes are made in any given year, adding to its exclusivity along with its price tag. “The amazing aroma as well as the taste of ‘His Majesty’s Reserve’ is so unique, it’s something that you will never forget,” said Hansotia. Another popular Gurkha cigar is the Royal Challenge. This cigar is mild-to-medium bodied; smooth and complex. The blend is highlighted by an aged silky Connecticut/Ecuadorian shade wrapper, a Habano/Honduran binder that is perfectly complimented by Nicaraguan and Dominican fillers. It is rated 91 out of 100 and also a winner of the European Printing Awards. The newest Gurkha cigar release is a collaboration between two companies with proud and long-established traditions:Gurkha and Ron Abuelo. Named the ‘Private Select,’ this cigar is medium bodied with hints of cocoa and nuts. The Maduro wrapper is the perfect marriage with the sweetness of the seven-year aged Ron Abuelo rum. The fullness of toffee and cocoa flavors are accentuated from the rum, while hints of leather and earthy undertones come through with the Nicaraguan cigar. Paired with Ron Abuelo rum or standing alone, the Private Select is inviting to any palate. Also from the East India Trading Company is the Red Witch. Named after a famous trading ship from the 1800’s, the Red Witch is a medium- to full-bodied cigar, featuring a silky Ecuadorian, Rosado wrapper, paired with a selected Dominican binder and three-year aged filler from the mountainous region of Jalapa, Nicaragua. This attractive, box-pressed cigar offers tasting notes of spice, earth and sweet delicate undertones with a long and smooth finish. Gurkha cigars with its reputation for unparalleled excellence, features 48 distinct brands of cigars. Most well-known for its super premium limited edition cigars, including the His Majesty’s Reserve, its core brands and the East India Trading Company line, Gurkha Cigar’s future is brighter than bright. When Matt St. Armant first discovered Gurkha’s newest super premium cigar the ‘Maharaja,’ he knew he had to have them in his shop; and Gurkha sales representative, Will Jackson, was more than happy to oblige. M.A.’s Smoke house in Shreveport, LA, is now the first domestic provider of Gurkha’s uber luxury cigar the ‘Maharaja’ which retails at $2,000 per cigar. “Gurkha is my favorite brand of cigar and the cognac-infused Grand Reserve is my favorite. When I first heard about the Maharaja, I knew I had to have it in my store. We started with the Triad and very quickly Gurkha’s became my go-to cigar. We’re very close to Dallas and the casions in our new location. Having the Maharaja is going to be a great draw for our store,” said St. Armant, owner of MA’s Smoke House. As with all luxury premium Gurkha Cigars, the ‘Maharaja’ is available only in small quantities – boxes of 10 cigars - and in limited release - only 10 boxes are being sold worldwide this year. Also, in keeping with the Gurkha tradition of presenting cigars in unique, award-winning artistic packaging, the ‘Maharaja’ is presented in a stunning, 10-count Mahogany wooden humidor with 10 individual piano-finished mahogany coffins for each cigar. It retails for $20,000 a box. M.A.’s Smoke House is located at 855 Pierremont Road, Suite 140 in Shreveport, LA 71106. For additional information call 318-861-3138 or visit their Facebook page. Gurkha is known throughout the world for producing the world’s finest and most expensive cigars. It was named after Nepalese warriors – the Gurkha’s – who fought so bravely alongside the British. The company, rich in legend, was purchased by Hansotia in 1989 with the intention of giving these unique cigars as gifts to customers of his family’s watch business. The cigars became such a hit, Hansotia began to produce more. As a result, the company was reborn and has since become one of the most famous brands of luxury cigars in the world. Bill Clinton, Bill Gates, Carlos Slim and an assortment of global dignitaries, world leaders, government officials and celebrities as well as the Special Forces and Seal Team Six are all clients. Today Gurkha produces eight million cigars per year that are sold in more than 50 countries worldwide. Each Gurkha cigar provides a luxurious experience different from the last. Gurkha Cigars, known for sellingthe finest, most expensive cigars in the world, has another side to its success. Gurkha’s East India Trading Company line went from zero to more than $1.5 million in sales in less than three years. The secret? “They’re inexpensive, but excellent quality blends,” said Juan Lopez, National Sales Manager. KaizadHansotia, founder and CEO of Gurkha, has owned the East India Trading Company name for a while, but it wasn’t until he and Lopez got together to create new cigar blends that the magic started to happen. The first cigar launched under this newly trademarked brand was the Wicked Indie. This all Nicaraguan puro is comprised of an oily Habano Nicaraguan wrapper, a carefully selected Nicaraguan binder combined with rare three-year aged Nicaraguan fillers and encompasses a rich and complex taste profile. The Wicked Indie is full of sweet spice and nuttiness that evolves to a long and cool finish. It sells for $5 - $6 a cigar. The second cigar launched was the Red Witch. Named after a famous trading ship from the 1800s, this is a medium- to full-bodied cigar featuring a silky Ecuadorian Rosado wrapper paired with a selected Dominican binder and three-year aged filler from the mountainous region of Jalapa, Nicaragua. This attractive box-pressed cigar offers tasting notes of spice, earth, and sweet delicate undertones with a long and smooth finish. It retails for $6 - $7 a cigar. Following on the success of the Red Witch, Gurkha launched the Rogue cigar. Using a carefully selected blend of tobaccos, Rogue is a bold, box-pressed cigar with a crafted unfinished foot. The blend features an Ecuadorian Habano wrapper, combining a rare Ecuadorian binder with a specially chosen blend of three-year aged Ligero's from Nicaragua, Honduras and Dominican Republic. This full-flavored cigar has complex tasting notes of spice, rich tobacco and roasted chestnuts. It sells for $7 - $9 a stick. After three successes in a row, Gurkha then went all out and created what they have called The Classic Cigar: Havana Blend. Under the auspices of Lopez and Hansotia, they created the perfect combination of a proprietary binder and filler with 20 different tweakings of the blend until they “got itjust right,” said Lopez. It has a San Andres wrapper, is box-pressed, medium bodied and full flavored with earthy, nutty undertones made in Nicaragua. It retails for $5.99 - $9.99, depending upon the size. Each of these cigars are also sold in beautifully packaged boxes of 20 and a perfect gift for the cigar aficionado in your life. The filler: This is the inside tobacco that forms the center of the cigar. Filler typically determine how strong a cigar smokes. The blending: The blending of wrapper, binder and filler that is what determines the overall flavor of the cigar. Ring gauge:Cigars are measured two ways: the length, which is always in inches, and the ring gauge. The ring gauge is the diameter of the cigar based upon 1/60th of an inch increments. The body: Decide if you are looking for a mild, medium or full-bodied cigar. The size:If it’s a short experience, then you want to look for a Toro-size cigar. If it’s longer, then you may want to try a Churchill. The flavor: Determine what flavor profiles you would like to experience: sweet, smoky, spicy, chocolaty, leathery, peppery, woody, earthy, nutty, creamy, etc. The price:If this is your first time smoking a cigar, stay away from the higher-priced cigars since, at this point, you won’t be able to truly savor the distinguishing elements of an expensive cigar. There are plenty of inexpensive cigars that hold top ratings from major cigar publications. The rating: Most cigar publications rate cigars. Those with good scores are typically posted. The construction: This will determine how smooth and even the draw is when you smoke it. You can test the construction of a cigar by rolling it between the thumb and index finger of your hand. You want the cigar to have a nice even consistency and fill. With a well-constructed cigar, the ash will maintain the shape of the cigar as it is smoked. This year ‘vintage’ is hip for weddings and grooms are wanting a greater say in designing their event. Earthy, natural and Boho chic are big themes with cigars for the groom and his friends playing a major role. Cigar Bars are the latest trend at wedding receptions with authentic Cigar Rollers creating custom cigars for every guest. For centuries, cigars have been a part of our most important celebrations. Giving cigars is like putting a stamp on our milestones; making an imprint for our most significant moments. And which of life’s great moments could be more significant than the joining of two souls in holy matrimony? Here are a few tips on how to create an amazing Cigar Bar. • Choose Your Space Carefully. Check with your reception venue for the best place to set up a cigar bar where those who want to partake can enjoy smoking while not bothering non-smokers. • Build Your Bar. Decorate the space with an elegant table that matches the wedding decor and a sign that reads “cigar bar.” Have humidors on hand to keep the cigars fresh. (While the Cigar Roller will hand each guest a fresh cigar, those cigars are too fresh and best smoked at a later date.) Have a server on hand to cut and light the cigars as well as have cigar cutters and lighters on the table so guests may use as they like. Have plenty of ashtrays available. Keep a few candy dishes around filled with mints for smokers to enjoy after their cigar. • Select Your Cigars: Choose an assortment of cigars in varying sizes and flavor profiles. • Hire a Professional Cigar Roller and/or Cigar Master: An authentic Cigar Roller adds to the uniqueness of the event and Cigar Masters can educate your guests about the cigars they're smoking, how to cut, toast and properly light cigars. • Have a Bar Open with Alcohol to Pair with their Cigars. Consider cognac, single malt scotch, bourbon, rum, rye or port. Inspired Events is the leader in the all-inclusive wedding planning & catering market in South Florida. They specialize in affordable luxury. For more information, visit http://miamiweddingsandevents.com. Gurkha Cigars was purchased in 1989 by Hansotiaand soon became one of the most famous brands of luxury cigars in the world. Bill Clinton, Bill Gates, Carlos Slim and an assortment of global dignitaries, world leaders, government officials and celebrities as well as the Special Forces and Seal Team Six are all clients. Having extraordinary quality, premium blends of tobacco and a reputation for unparalleled excellence, Gurkha now offers 48 distinct brands of cigars.It produces five million cigars per year that are sold in more than 25 countries worldwide. Many of their cigars are rated 90 and above, including the Cellar Reserve with a 97 rating and the 125th Anniversary cigar ranked at 96. It’s no wonder Gurkha has found its way into the ultimate institution of celebrations – the wedding. The International Headquarters of Gurkha Cigar Group Inc. is located at 6600 Hiatus Road, Tamarac, FL 33321. For information, visit www.gurkhacigars.com. To purchase Gurkha Cigars, visit your local tobacconist or you can log on to www.cubracigars.com. Gurkha Cigars has completed the line of Cellar Reserves with the new release of the Cellar Reserve Platinum cigar. With each of these releases, the Cellar Reserve family of cigars has been one success story after another. The history of the Cellar Reserve family begins in 2007 with the release of the original Cellar Reserve cigar. It grew with so much success that Gurkha’s founder and CEO KaizadHansotia decided to expand the line. Despite the Cellar Reserve cigars being in one family, each has a different flavor profile. The vintage Gurkha Cellar Reserve uses the finest quality 15-year-old aged tobacco,an oily Criollo 1998 wrapperand 15-year old Dominican filler. It’s rated a 97 and named Top 10 Cigar of the Year. The Gurkha Cellar Reserve Limitada is a rich and robust cigar using the finest quality 15-year aged tobacco with a Brazilian ArapiracaMaduro wrapper. It has a 90 rating. When it comes to super premium luxury brands and prestigious companies, names like Louis Vuitton, Moet Hennessey, Patek Philippe, Chanel and Rolls Royce get bandied about, but when the conversation turns to cigars, there’s only one name spoken. Gurkha! Gurkha is known as the finest and most expensive cigar maker in the world. Housed in a beautifully appointed facility nestled in a corner of the Southeastern United States known as South Florida, Gurkha Cigars are sought after by the world’s most elite. They’re coveted by collectors and bona fide cigar aficionados. It was among this exclusive audience that Gurkha became known as the Rolls Royce of cigars. Some of Gurkha’s renowned fans include Bill Clinton, Middle East royalty and Hollywood’s A-list actors. Gurkhas were given out by Brad Pitt and Matthew McConaughey at the birth of their children. Sylvester Stallone and Harrison Ford smoke Gurkha’s and many of the wealthiest families in China and Russia hand out Gurkha Cigars at weddings, which is considered to be one of the among the highest honors a company can receive. Not satisfied having just one of the world’s most exclusive super premium cigars, Hansotia, once again called upon his unparalleled genius and cigar industry savvy to bring the ‘Maharaja’ to fruition. The ‘Mahajara’ isnot an infused cigar, but rather a secret blend of the best quality tobaccos available. The beautiful maduro wrapper pairs Dominican binder and fillers to create a smooth and sweet taste on the lips. The Gurkha ‘Maharaja’ is medium bodied and, of course, one-of-a-kind as is its price tag reveals. It retails for $2,000 a stick and Gurkha once again retains the title for being the finest and most expensive cigar maker in the world. As with all luxury premium Gurkha Cigars, the ‘Maharaja’ will be available only in small quantities – boxes of 10 cigars - and in limited release - only 100 boxes will be sold. Also, in keeping with the Gurkha tradition of presenting cigars in unique, award-winning artistic packaging, the ‘Maharaja’ will be presented in an exquisite wooden humidor. If you are starting to feel like this is a luxury item that you have missed in life, worry not. If you want to join the ranks of the rich and famous like Donald Trump, Gurkha will make you a custom blended cigar exclusively for you that is specifically designed to your taste preference and only you will be able to order that blend of cigar. Now that is the ultimate in luxury! The world’s finest and most expensive cigar maker -- Gurkha Cigars -- showcases its premium hand-rolled cigar – the Prize Fighter – that retails for under $2 per stick at the 2014 NACS Show. An easy smoke for anyone’s palate, the Prize Fighter is a mild-medium bodied cigar with a smooth and elegant flavor profile. The blend showcases a stunning Connecticut shade/Ecuadorian wrapper that pairs perfectly with an Ecuadorian/Indonesian binder and a 3-year aged Dominican filler. It is packed in a fresh-lock, sealed pouch of five sticks per pack wrapped in perfect humidification that you can take on-the-go for a perfect smoke every time. They retail for less than $2 per stick or under $10 per pack. Prize Fighter is available in three sizes: 5 x 52 Robusto, 6 x 54 Toro and 6 x 60 XO. Part of Gurkha Cigars’ East India line of affordable cigars, the Prize Fighter was inspired by the boxing heroes of the 1900's when the men were men and real men smoked cigars, said founder Kaizad Hansotia. Stop by Booth _____ any day during the NACS show for a sample to enjoy this unique flavor experience. KaizadHansotia, Founder and CEO of Gurkha Cigars, along with the entire Gurkha team have joined forcesto help those children and families affected by the earthquake in Nepal. More than 3,000 people lost their lives and thousands more were injured in a 7.8-magnitude earthquake that hit Nepal's capital Kathmandu and its surrounding areas on April 25, 2015. That earthquake was followed by a large number of aftershocks, including one that measured 7.3 on May 12. Many have been left homeless by the disaster and living in makeshift camps around Kathmandu. Now the country is reported to be running out of water and food. When Gurkha Cigars took on the Pedro Martin Brand, a spiritual pact was made. That pact was to honor Pedro Martin, the world-renowned master cigar blender, by honing in on family traditions. Thus, embarking on this new project to rebrand Pedro Martin, Gurkha Cigars focused on family, culture, and pride. The Pedro Martin family goes back generations; first in Spain, then in Cuba and finally in the United States, perfecting the art and craft of making the finest cigars. No detail is ever left to chance and every opportunity to improve, to refine and to develop is seized. Now through Gurkha Cigars, Pedro Martin has a brand new look that was built on centuries of Cuban heritage and culture with reproductions of the brand’s Maduro, Ruby and a Limited Edition cigar, all captivatingly Cubanesque. Showcasing the award-winning artistry of Gurkha Cigar Group, the Pedro Martin label has been redesigned to feature a regal family crest that exudes the proud history of the master blender himself. It begins with a revised version of Pedro Martin’s initials – PM - in the center of the crest. The crown above the initials and the sun’s rays emanating skyward symbolize Martin’s commitment to becoming one of the finest master blenders in the world. The green Palma Real leaves are symbolic of Cuba and the four flags chronicle the life of Martin. On the left, the Cuban flag is the home of his birth and the Dominican and Nicaraguan flags symbolize where he worked and lived. The American flag represents where he died. In the background on the right is the Castillo de Jagua, the well-known landmark that protected the City of Cienfuegos, which is close to Manicaragua, Cuba, where Martin was born. The illustration on the left is Pinar del Rio in Vuelta Abajo, the finest place to grow tobacco in the world. It is where Martin traveled to learn the trade and ultimately would purchase the finest tobacco leaves for his signature cigars. The flowers in gold at the bottom of the crest are the flower of the tobacco plant and the Cuban flower “mariposa” or butterfly. The coins lining the bottom signify the Cuban national bird – the Tocororo, the Cuban flower – Mariposa, the crest of Pinar del Rio and then crest of Cienfuegos. The gold leaves above the dates are cigar leaves and the crest culimates with two dates: Martin’s birth year – 1920 – and the year of his death – 2010. As part of Gurkha Cigars, the three Pedro Martin offerings are as follows. • The Pedro Martin Ruby is a delightful cigar with a beautiful Colorado Red Corojo Wrapper and a Puro Premium Nicaraguan Binder and Filler. It is a medium- to full-bodied premium smoke with a tinge of spiciness. It is more flavor than strength and delightful to the palate. • The Pedro Martin Maduro contains a bold Mexican San Andrés Wrapper paired with some sugar, spice, and all things nice. To complete the cigar, a Nicaraguan Maduro binder holds together Grade A Premium Nicaraguan fillers from a few of the most tasteful areas of Nicaragua. A hint of spice and caramel with cocoa makes this cigar a winner in any humidor. • The Pedro Martin Limited Edition is a strong and full-bodied cigar that has hints of sweet spice, milk chocolate, and roasted nuts with a long earthy finished. It is rich and sweet with lots of aroma. This wonderful Pedro Martin cigar is one that a true cigar enthusiast will appreciate. This cigar was released toward the end of 2013. Only 500, 15-count boxes were made and it received rave reviews. The success of Gurkha Cigars naturally starts at the top with Founder and CEO Kaizad Hansotia. Hansotia’s expertise is two-fold. He has a very specific global vision for the future of Gurkha and an incredible eye for artistic detail. Both of these combine to provide unique, one of a kind cigars that continue to make the brand memorable. It all began in 1989. Hansotia was on vacation in India and met a man who was rolling and selling cigars. He bought the man’s entire stock with the intention of giving them away to his family’s watch customers as a complimentary gift with their purchase. When customers returned asking for more cigars, he realized he was on to something. He brought what he had back to the United States and partnered with the Torano family to learn and build his brand.Since then, Gurkha has worked with many different factories to perfect new blends and develop the Gurkha into a household name. Over time, Hansotia followed his vision and shaped his company into a global force. “Change is key in this business,” he said. “To stand still is to die, so we continue to produce limited-edition cigars while we are constantly developing new brands. With outlets such as social media and the Internet, information is readily available. If you’re not on the front page, you might as well be gone.” So he’s put together a great ensemble of talented people who work together to bring the brand to the next level. Juan Lopez, National Sales Director, has spent 18 years in the cigar industry. He personally knows many of the retailers across the country and considers them his personal friends. In addition he is the in-house blender for Gurkha, the brand builder and international brand ambassador for the brand. Currently, Lopez oversees nine reps nationwide. How does he keep them motivated and engaged? “Each of my sales reps sets personal goals,” he said. “We have company goals, but it’s more meaningful for each individual to have a personal stake in what we do. Of course, we have bonus structures and commissions and I’m here to help them grow their accounts as well. I also travel with the crew constantly. We get to know each other very well. When you have a great team and you love what you do, it is easy to come to work every day,” Lopez concluded. Each rep has a specific territory that they cover from coast to coast. “We call them our Road Warriors, said Bianca Melone, the Director of Marketing “because they battle the road every day to build the Gurkha followership, which continues to grow the brand.The reps range in experience from five years to 18 years in the industry. They constantly learn and work together with the help of technology, including group texts, emails and phone calls. From coast-to-coast our Road Warriors include Armando Lapido who handles Florida and the Gulf Coast to New Orleans; Ken Mansfield who directs business in Georgia, Tennessee, Alabama and Kentucky; Steve Cook who expands into South Carolina, North Carolina, Washington, D.C., and Virginia; Charlie Watson who represents Maryland, Delaware, New York, New Jersey and Pennsylvania; Will Jackson who handles Arkansas, Louisiana, Missouri, Oklahoma and Texas; Shervin Fageliarif who travels in Arizona, California and Nevada, and Allyson Perez and Cristiana Santana who support the crew from Gurkha Headquarters. Carlos Llaca-Torano, Operations Director, rounds out the Gurkha team. Llaca-Torano is responsible for the overall operations of Gurkha, which includes inventory management, personnel management, contact with the factories and quality control as well as new product development and sampling. Llaca-Torano has cigars in his blood. His family has been in the tobacco business for the last century. “My goal at Gurkha is to become more efficient in streamlining operations, reduce backorders and maintain the high-quality established and expected within the brand,” he said. Given the prospect that the 50-year-old Cuban trade embargo may soon be being lifted, many in the tobacco industry are speculating about what this will mean regarding the mystique that surrounds Cuban cigars as the “forbidden fruit,” now that it’s no longer forbidden. Will Cuban cigars still be considered superior? Will Cuban cigars retain their stellar reputation once they are no longer considered contraband? Or has isolation and neglect of the Island Nation destroyed what was once a truly unique crop? Top cigar companies such as Davidoff, Gurkha, Flor Dominicana, Padron and Pepin Garciaall produce premium cigars that can stand up and compete with a Cuban cigar any day of the week. By comparing the flavor profiles of Cuban cigars with the finest cigars from around the world, here are five distinct reasons why Cuban cigars are NOT better. 1. Cuban cigars are one dimensional in their flavor base. They don’t have the complexity that blended cigars have. The tobacco isn’t grown in different soils from other well-known tobacco nations such as the Dominican Republic, Nicaragua or Hondurasfor example. How can Cuba compete? What will Cuba do? The general consensus is that Cuba will not even try to compete. The Cubans willshy away from buying any tobacco made outside of their native country.But their biggest concern should be how introducing their tobacco to the Dominican Republic and Nicaragua will fare given that blends from those countries will continue to be made better. 2. Quality control outside of Cuba is 10 times better than it is inside Cuba. Hand rolling cigars is tiring and only the best rollers in the world can be consistent with their rolling style throughout their entire shift. Draw testing cigars is the best way to make sure they are not rolled too tightly or too loosely. Yet draw testing can slow down production, increase costsand is often overlooked. Tightly rolled cigars then pass through the line all too frequently. 3. The Communist regime has left its mark on half a century of workers. Wages are still low. Morale is low. Labor conditions are still poor and the labor force remains unmotivated. 4. Around the time that the Soviet Union began to fail, petroleum became scarce in Cuba. It became more difficult to rotate crops regularly. Animals like oxen and mules became more common in agricultural systems to rotate crops, but there remain rumors that the land has become bad for farming. 5.Once Cuba opens up, the demand for skilled rollers will increaseelsewhere. Other countries, willing to pay more, will be able to lure quality workers away from Cuban factories. All of these changes will cause the already inflated prices of Cuban Cigars to raise substantially as demand for greater wages will cause prices to increase 10 times the current rate. In conclusion, while the demand for Cuban cigars will most likely increase in the short term once the embargo is lifted because even the casual cigar smoker will be interested to see what they’ve been missing all these years, it won’t be a permanent situation.The increased demand will probably cause alower quality product, creating disappointment and sending the regular cigar smoker right back to his or her favorite brand. All of these points are, however, positive for the rest of the cigar-making world. Consumers will initially get their “fix” and be driven to better quality cigars made outside of Cuba. For the cigar aficionado, a wonderland exists in a most unusual place. Nestled in an unassuming commercial warehouse in western Broward County, Florida, Gurkha Cigars quietly carries on a century-old tradition of excellence by bringing the finest cigars to connoisseurs worldwide. Gurkha Cigars is known for its limited release and rare tobacco products with outstanding and artistically-oriented packaging. It has established a name for itself by consistently producing top-rated cigars as well as the world’s most expensive cigar, His Majesty’s Reserve (HMR), at nearly $20,000 for a box of 20. While Gurkha Cigars offers a wide range of cigars, the sheer magnitude of cigars requires a humidor equal to the task of protecting them. Inside their 25,000-square-foot facility is a three-room, temperature-controlled, 9,000-square-foot humidor, possibly the world’s largest. It is insured by VRA Insurance, a trusted provider of insurance solutions for unique and significant high-end assets. Considered to be the ‘Rolls Royce’ of cigars, Gurkha Cigars’ facility matches its reputation. In addition to their impressive humidor, other unique features include an elegantly rich smoking room encased in dark wood and sultry leather furnishings; an elaborate bar, housing the finest in blended and single-malt scotch, bourbons, aged rums and vodka plus a private rolling room accessible only via an Indiana Jones-type secret entrance. And finally, in case you were wondering what makes the Gurkha HMR cigar so expensive, its wrapper is a blend of 15-year Connecticut Maduro with a 12- year-old Dominican binder and filler that’s aged with one bottle of the world’s finest cognac. The cognac was originally sold only to dignitaries and now with the HMR, it’s available to consumers as well. But only 75 boxes will be made. “The amazing aroma as well as the taste of the cigar will be something that you will never forget,” said owner Kaizad Hansotia. For the sixth year in a row, Gurka Cigars, makers of the world’s finest and most expensive cigars, have partnered with The Eric Trump Foundation to raise money and awareness for children battling life-threatening diseases at St. Jude Children’s Research Hospital. This year, they offered a special private label cigar specifically for the Eric Trump Foundation that sold at auction for $30,000, following the golf tournament and fundraising gala. The cigar will be blended and produced specifically for the winner of the auction, who will visit Gurkha Headquarters in Tamarac, FL, in the coming months. Founded in 2006, The Eric Trump Foundation has donated and pledged nearly $28 million dollars to St. Jude and grown into one of the largest private charities in the country. Through direct personal involvement and financial assistance, they demand that their monetary donations are transformed into real results at St. Jude. By using only Trump-owned and -operated facilities, full-time volunteers, donated food/beverage product & pro-bono celebrity performers, The Eric Trump Foundation maintains one of the lowest expense ratios of any charity in the world. The charity also insists that St. Jude receive nearly all of the monies raised each year and nothing is expended on unnecessary overhead and salaries. FORT LAUDERDALE, FL – A brand new vintage Cabernet Sauvignon joins the ranks of the world’s finest wines. Launched in limited release, Asura has already garnered rave reviews, including a Number 1 rating for Cabs in 2014 from Cigar & Spirits magazine. Asura is distributed by Grilos International in Ft Lauderdale, Florida. It’s a rich and luxurious 2012 Cabernet Sauvignon from Mt. Veeder, a dry vineyard with an elevation of 1,900 feet in Napa Valley, California. Along with its Mt. Veeder pedigree, Asura has an equally impressive price tag. It retails for $469 a bottle and there were only 3,000 bottles produced for this first limited release. According to Alessandra Rotondi, the highly credentialed New York wine writer, restaurant wine consultant and certified sommelier, the 2012 Asura Cabernet Sauvignon lives up to its hype. The same exquisite care that went into creating Asura the wine is reflected in its stellar label design. In Hinduism, the asuras are angels to the gods. The label depicts a voluptuous masked female warrior in form-fitting black strapless dress and black boots, wielding a mighty sickle and hovering in mid air by massive outstretched wings. Cigars are no longer just for the seasoned smoker. They have become a staple in society for rookies and veterans alike, representing an air of character, class and pleasure. Whether it's a satisfying smoke after dinner, during a round of golf, or out at the bar for drinks, cigars are the perfect complement to your lifestyle because that is exactly what defines cigar smoking — your lifestyle. Welcome to the good life. The process of selecting a smoke that suits your taste starts with an examination of your preferences, as there are thousands of cigars available. The first thing to consider is what type of bodied cigar you are looking for. From mild or medium to full, the overall strength should be tasty while not overwhelming on your palate. The next thing to consider is size. The size of the cigar has some effect on the flavor, but should be factored in from a time standpoint more than anything. For example, a cigar for the golf course can be up to seven inches and be perfect because you will have a couple of hours to work your way through it. However, if you were short on time, a five-inch cigar with a smaller diameter would suit you more for a quick smoke after lunch. When discussing cigar sizes, two things are taken into consideration. The first is the length, which is always in inches, and the second is the "ring," which is the measurement of the diameter. The "ring" unit of measurement refers to 1/60th of an inch. For instance, a corona that is typically 5.5 x 42 means that the cigar measures 5.5 inches in length and 42/60ths of an inch in diameter. Further, whenever you are reading or discussing cigars, a cigar rating (0 - 100) will most definitely come up in the conversation. This rating is a system that was designed and is used by Cigar Aficionado magazine. So before you head out to a cigar shop, find out how to select a quality stogie. "While everyone's preferences and tastes are different, there are certain qualities a cigar has that make it superior to others," explains Alex Svenson, an aficionado in the industry. "To arrive at these ratings, one must consider such factors as the cigar's appearance, construction, and the way it smokes. Another central factor in rating a cigar is its aromas or flavors and the balance of these various competing aromas that give the cigar its overall taste." Alex is a younger smoker and professional who is very in tune with the most recent trends in cigar smoking. That’s how Gurkha Chief Executive Officer Kaizad Hansotia explains his HMR reserve. And at $25,000 for a box, he says that averages out to about $1,000 a stogie. How’s demand? He says there’s a three year waiting list. Those who love them include actor Matthew McConaughey and the very broke former President Bill Clinton. Hansotia told Bloomberg News recently that he expects a slight increase in price soon, when a box will go for $30,000. It’s made from 18-year-old tobacco and soaked in the most expensive cognac.